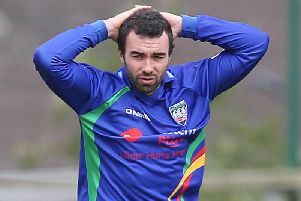 James Cameron-Dow claimed his second five-wicket haul in successive matches on tour, as Ireland Wolves took 11 wickets and enforced the follow-on on Day Three of the Ireland Wolves versus Sri Lanka four-day match at the Mahinda Rajapaksa International Cricket Stadium in Sri Lanka. Resuming overnight on 99-3, Sri Lanka A’s batters tasked themselves with batting towards safety, and were led by a century from Angelo Perera (his 16th first-class century in his career) and a solid innings of 72 by middle-order batter Shammu Ashan. However, with the home side looking increasingly comfortable at 227-4, Wolves seamer Craig Young struck for his third wicket of the innings, removing centurion Perera and opening up an end for the Wolves bowling unit to attack. That subsequent attack was led by Cameron-Dow who claimed a five-wicket haul for the second time on the current tour. Cameron-Dow has now taken 12 of the 20 Sri Lankan wickets to fall in the series to date, at an average of 15.75. Sri Lanka A’s final six wickets fell for 76 runs, ended with a 205-run first-innings deficit. 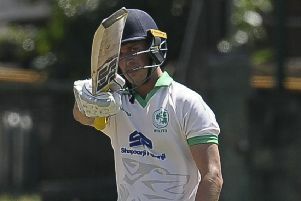 Wolves captain Harry Tector then elected to enforce the follow-on and moments later the Sri Lankan openers returned to the crease with almost a session-and-a-half still to play in the day. Not letting up the pressure, left-arm paceman Josh Little struck first this time, removing opener Avishka Fernando for 15. Leg-spinner JJ Garth claimed two further wickets, and Cameron-Dow removed captain Ashan Priyanjan to put the Wolves in a solid position by the end of Day Three, with Sri Lanka A on 180-4. After play, Wolves Head Coach Pete Johnston said: “I think in this game the guys have applied their learnings from the previous game and our time in Sri Lanka so far. We have been on an upward curve day-by-day throughout the tour and hopefully that can continue. There has been a lot of hard work put in by the squad at practice, on recovery work, and there have also been some great discussions around adapting to conditions here. “Captain Harry [Tector] considered both options around the follow-on thoroughly, but in the end, the bowling unit had their tails rightfully up and wanted to give it a crack. It turned out to be a longer evening session than we expected due to not as much cloud cover which meant the light lasted. With patience and discipline we should be able to capitalise tomorrow.